Working with Elevator Promotional Marketing and Stena Line we were asked to survey, print, install and project manage the interior branding for both the Football Friendly and Football Free areas on 8 Stena Line ships – the Lagan, Mersey, Superfast VII, Superfast VIII, Adventurer, Superfast X, Europe and the Horizon – in Belfast, Dublin & Rosslare for the Euro 2016 Championships. Initial surveys. On average the 8 ships were in port, during passenger changeover, for 3 hours during which time we had to board, identify suitable areas for branding, take all measurements and photos and disembark before the ships set sail again. Our surveys were completed and sent to Elevator Promotional Marketing for review and decision on final branding with Stena Line. Finished artwork was received from Elevator Promotional Marketing during the last week in May. We printed and packed a selection of all items for the 8 ships and installations were scheduled for Belfast on Monday 6th & 7th June, Rosslare for Tuesday 7th June and Dublin for Wednesday 8th June. 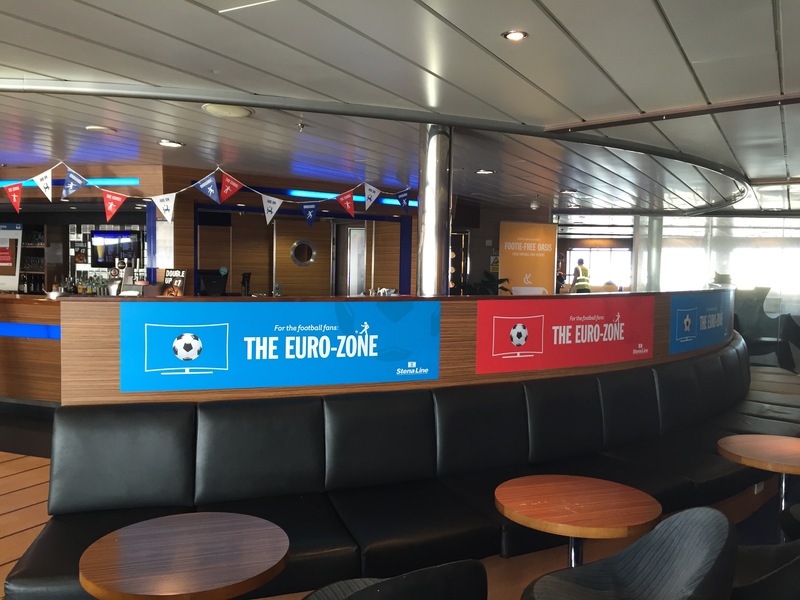 Again on average the 8 ships were in port, during passenger changeover, for 3 hours during which time we had to board, complete the installation of all branding in both the Football Friendly and Football Free areas and disembark before the ships set sail again. All 8 ships were completed on schedule and the finished job looked fantastic. Great team effort’s all round along with Elevator Promotional Marketing and Stena Line. Well done to all concerned.